Qualified Domestic Relations Orders – James F. Gulecas, P.A. We prepare Qualified Domestic Relations Orders (QDRO’s) for divorcing clients who have agreed to split their qualified retirement plans with their former spouses as part of their Marital Settlement Agreements. QDRO’s are required by federal law to divide qualified retirement plans, e.g. pension plans, defined benefit plans, profit sharing plans, and 401(k) and 403(b) defined contribution plans. The Marital Settlement Agreement and divorce decree alone do not do this. QDRO’s are not required to divide traditional or Roth IRA’s. All that is required is a letter of instruction to the financial institution with a copy of the divorce decree and Marital Settlement Agreement. This letter is commonly called a “408(d)(6)” letter. 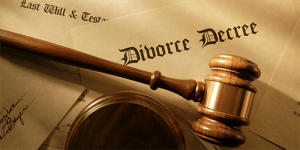 Our practice is to file a Notice of Limited Appearance in the divorce proceeding allowing us to substitute in as attorney for the spouse who engages us for the limited purposes of filing the QDRO. Divorcing clients should also update their estate plans and beneficiary designations to ensure that their ex-spouses are no longer beneficiaries except where required under the Marital Settlement Agreement.